While this year’s strong El Niño has yet to produce many drought-busting storms, it is accelerating erosion up and down California’s coast, including at the University of California, Santa Barbara. Photo by Jeremy P. Jacobs. ISLA VISTA, Calif. -- This winter's El Niño has brought warm temperatures and big waves to this coastal college town, where surfing is a favorite pastime. But it's also gobbling up cliffs under student housing at an alarmingly fast rate. California has been counting on El Niño to quench its historic, four-year drought. But drought-busting storms have yet to fully materialize, and researchers say El Niño may do more to hurt the state than help by ravaging beaches, cliffs and bluffs. That effect has been on full display recently in Pacifica, near San Francisco, where apartment buildings teetering at the edge of tumbling into the surf have been condemned. And it's clear here at the University of California, Santa Barbara, where cliffs have receded more than 30 feet since the 1940s, leaving houses perilously close to the lip of a 40-foot drop. State and federal researchers say there are countless other examples up and down the coast. El Niño, they say, produces the perfect recipe for coastal erosion. In fact, short-term erosion rates can accelerate anywhere from two to 10 times during El Niño years, according to some early research. The U.S. Geological Survey estimates that El Niño cycles corresponded with about 75 percent of erosion and storm damage on the central California coast in the 20th century. Some areas could recede by as much as 5 feet this year alone. Those figures alarm geologists and oceanographers, who believe California's heaviest coastal development occurred during a "cool" temperature phase in the Pacific Ocean -- from about 1947 to 1977. El Niños are rarer during cool cycles, so erosion rates may have been low then. But with the ocean believed to be entering a "warm" phase now, El Niños may become more frequent and accelerate erosion. This year's phenomenon is also providing a glimpse into the future of what the coast will look like as sea levels rise due to climate change. The research, in its nascent phases, is seeking to use this year's El Niño as a proxy for what the ocean and coast will look like 50 to 100 years from now. "If more large waves and storms hit the coast this year, it could cause significant erosion," said Adam Young of the Scripps Institution of Oceanography at the University of California, San Diego. "Bigger waves combined with lots of rainfall are definitely going to cause more erosion," he said. "Combine that with sea-level rise. If all those factors come true, there will be more erosion in the future." El Niños occur when the usual trade winds flowing from east to west over the Pacific Ocean die down, allowing sea surface temperatures along the equator to heat up. They influence weather patterns across the globe and produce a trio of effects that are particularly damaging for coastal erosion. First, they elevate seas in California mainly because the water is warmer -- and thus less dense -- and because the usual trade winds aren't pushing it west to Indonesia and Australia. Those may sound like minor factors, but when applied to the hundreds of miles of Pacific Ocean affected during an El Niño cycle, they make a major difference. "We've had significantly elevated water levels along the California coast" since July, said Lesley Ewing, a senior engineer with the state's Coastal Commission. Ewing estimates that sea levels in southern and central California have been 8 to 12 inches higher than normal. That's the equivalent of about 50 years of sea-level rise at its current pace, and it means tides are significantly higher and are causing much more flooding. Second, El Niños typically shift storms that usually reach the Pacific Northwest to California -- in particular, Southern California. Those storms haven't fully materialized this year, but increased rains soak into cliff and bluff soils, making them heavier and more susceptible to collapsing. Third, and most important, El Niño affects waves. Elevated sea levels and water volume mean waves are larger and break closer to the shore. That's great for surfers, but disastrous for beaches and cliffs. Wave energy, judged by its size and force, usually increases by 20 to 30 percent during El Niño years, USGS's Patrick Barnard said. "If you have higher sea level and bigger waves, you are setting the stage for coastal erosion," said Bob Guza, another researcher at Scripps. There is also a factor of chance. In order for the most rapid coastal erosion to occur, these factors need to align -- typically in the form of big storms occurring during "king tides," an unscientific term for abnormally elevated winter tides. That hasn't happened very often this year yet. In the winter of 1982-83, however, at least seven major El Niño-driven storms coincided with high tides, causing millions of dollars in damage and coastal loss. El Niño accelerates beach and cliff erosion in related ways. In a normal, non-El Niño winter, waves and tides cut away sand from beaches, moving it offshore and making beaches narrower. In the spring and summer, waves bring the sand back, restoring a beach's width. Parts of that cycle change in an El Niño year. Waves are stronger, so they carry more sand away and take it farther offshore. On top of that, El Niño's impact on normal weather patterns also shifts the direction from which winds and waves come along the Southern California coast. Instead of coming down the coast from the northwest -- where they are usually blown by the non-El Niño jet stream -- waves are often driven from winds to the west and southwest. That means waves and storms approach the West Coast from about 5 to 10 degrees farther south during an El Niño winter, Barnard said. So California beaches that are accustomed to sand being dragged away and returning in one direction suddenly see erosion from a different angle, which can make it more significant. The past five or six years have produced only limited beach erosion, said USGS's Barnard, so beaches started wider than usual this year. But he added that El Niño's effects may be more severe because of that. "That's a hazard for these vulnerable areas that have maybe done OK over the past five to six years, when we've had mild winters," he said. He also noted that because of the larger waves, more sand is pulled farther offshore. "Sand can get taken so far offshore that it can't be picked up by smaller waves in the future," he said. "It doesn't come back." Barnard and others are now studying exactly how much sand is permanently lost in an El Niño year. After the last major El Niño winter, in 1997-98, it took three years for beaches to recover, Barnard said. Some never did. That's important for cliffs and bluffs, too. Sandy beaches work as a buffer between waves and cliffs, Ewing of the Coastal Commission said. Once they are eroded, there is nothing to stop the larger waves from hitting cliff bases, where permanent damage occurs. "It's that energy," Ewing said. "The pounding, pounding, pounding on coastal bluffs and beaches." While researchers are anxiously watching how much of the coast this year's El Niño will gnash away, they are also trying to use it to predict future erosion due to climate change. The California King Tides Project, for example, is a citizen-driven effort to document flooding and other coastal effects due to the elevated sea level during this winter's El Niño. Its goal is to capture images of what the coast may look like if climate change leads to more frequent El Niño patterns, or more extreme storms and tides like the ones the state is experiencing this year. "Some people are using the El Niño conditions as what we can expect in normal winter storms for the next 20 years," Ewing said. Other researchers are looking further into the future. Professor Edward Keller at UC Santa Barbara is conducting a two-year study that he hopes will provide coastal planners with a much clearer picture of what the coast will look like and how quickly it may erode 50 to 100 years from now. Keller says the elevated sea level this year -- about 8 inches to a foot -- is approximately where the sea level will naturally be in 2100 based on current projections. This year's El Niño, he said, "provides a window of opportunity for what erosion will be. We're trying to get a better idea for how to plan for future erosion." Keller's team is using light detection and ranging technology, or lidar, to scan six locations along the Santa Barbara coast after major wave events this winter. Lidar uses remote sensing technology that provides precise measures every 1 to 5 centimeters. That allows Keller to create digital 3-D models of the coast. By the end of this year's El Niño, Keller should be able to match up those scans to see what parts of coastal cliffs crumbled into the ocean. Scans with that amount of detail have never been done before. Some lidar measurements were taken after the 1997-98 El Niño winter, but they weren't as robust. 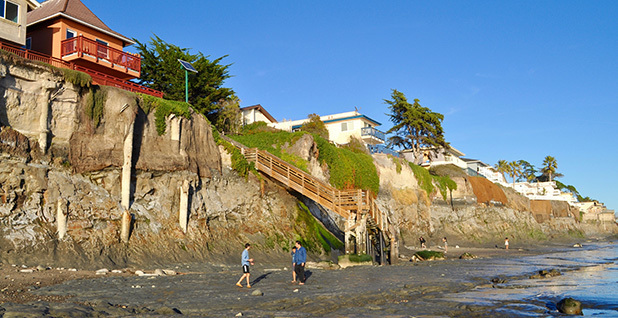 Keller's work will be particularly important to Isla Vista and UC Santa Barbara, where some cliffs erode an average of 4 to 6 inches every year and cliffs under some houses are already dramatically undercut. And a new study suggests that sea-level rise may be more dramatic than current predictions. A paper published yesterday in the Proceedings of the National Academy of Sciences concluded that oceans rose faster in the 1900s than any of the previous 27 centuries. The team of researchers found that human-driven greenhouse gas emissions were the primary cause and concluded that sea-level rise could accelerate during the 21st century as rising temperatures melt ice sheets in Greenland and Antarctica. If that happens, ocean levels could jump more than 3 feet by 2100, significantly more than current projections of the 8 inches to 1 foot, the paper found, causing more severe coastal erosion and flooding. For now, though, Keller's research is focused on how exactly a cliff erodes -- whether it's a direct response to the wave itself or a combination of other factors. His team has already observed, for example, that undeveloped cliffs tend to be more resilient than developed ones. And he's also testing the hypothesis that erosion speeds up by between two and 10 times during El Niño years. If that's true, some areas here could recede up to 5 feet this year alone. Keller's research is particularly important because the state may be heading into decades when erosion will occur more quickly than it has previously, said Gary Griggs, an earth science professor at the University of California, Santa Cruz. Griggs, who has researched erosion in Northern California, pointed to a phenomenon called the Pacific Decadal Oscillation. For reasons that still aren't well understood, the Pacific Ocean appears to switch between warm phases and cool phases about every 20 years. Warm phases are much more susceptible to El Niño events and, consequently, accelerate coastal erosion, Griggs said. Griggs noted that the most of California's coastal development took place between about 1947 and 1977 -- a time span that corresponded almost exactly with a cool Pacific Ocean phase. That cycle has since flipped three times -- to warm around 1977, then to cool until the mid- to late 1990s, and now there's speculation the ocean is moving back to a warm phase. Griggs said that means California could see more frequent El Niño events in the next 20 years and more severe coastal erosion as a result. "What's important is to realize that if we're in for another 20-year-long warm cycle, we could see El Niños pretty frequently," Griggs said. If he lived on a cliff or bluff, Griggs said, "the next 20 years are the ones I'd be very concerned about."